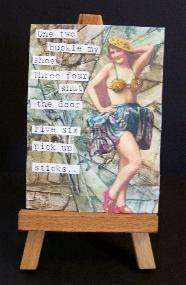 Well I don't have a gallery as such but I thought I would share some of my recently made ATC's. In early May a group of us fellow painters met for our 2nd reunion, we all met online and have formed friendships that you would not believe. Another story another day.....well when I was in Pittsburgh one of my friend's husband comes to me with one of these small easels in his hand and said "are you looking for these?" or something to that effect. Well of course I was just all over it, not him the idea. Anyways I proceeded to an area for ATC's, for those of you who are new to these or don't have any idea what they are, they are small pieces of art that are traded, or exchanged between artists. No money is changed hands, there are several groups out there that you can join and it is a wonderful way to meet people, exchange ideas, techniques and just ooh and ahhh over these little masterpieces. Some of them you would not believe. I have a binder full of these gems and I love looking at them. So back to the easels, I have a corner shelf in my living room and every now and again I put a new piece of art on each easel. JB always knows when I change them, today I have put up 2 of these 5 I am about to show you. These cards do have a regulation size of 2 1/2"x 3 1/2", the same as a regular size playing card. So without further ado I will show and explain a little about each then I am off to upload them to my ATC for beginners and see who haggles for what. These gals are crazy. Before you know it your email is coming in with wanna Trade? in the subject line. You sometimes have to read what time what email comes in so the first one asking gets the card. I tell you it is like going to an auction and wanting that item, the haggling and bartering and I will make you this or tell me what you want me to make is amazing. He he and all over a little piece of artwork. 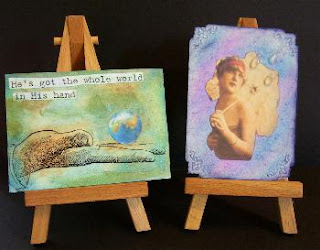 So here are my 2 fav at least for today, the one on the left is "He's got the whole world in His hand", fitting I think. I coloured on some C/S with watercolour pencils, let dry, then rubbed some chalks with my fingers around the edges , added some Folkart Metallic Periot paint, the hand is a packing tape transfer and the world is a graphic I printed off from a program. The one of the right is called "It's raining again", what you mean like today??? yup. I did the same sort of idea using the watercolour pencils, when dry I really rubbed the chalk to blend the colours a bit more. I used a corner punch and inked that so you could see the bit of embossing, then the rain drops?????? how did I do those you ask??? HOT glue, I put some hot clear glue from my glue gun on an acrylic block, let it cool then just glued them on the umbrella. I just love how this one turned out. 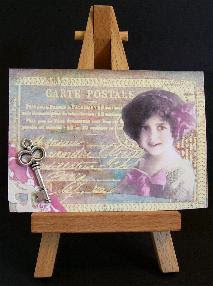 I also have an inchie with this same image and small glue raindrops too. 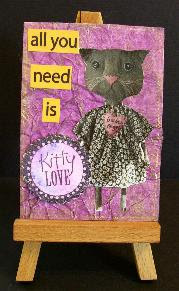 Next is Kitty Love, who doesn't love a kitty? and this poor little fella needs a good home. I have done a tissue paper background, rubbed the paper again with some metallic gold paint, then a gold gel pen around the perimeter like a border on the card. Then I stamped the Kittly Love after I did some w/c pencil on C/S, the words are from something I was about to throw out, a flyer or something but when I saw those words I had to save them just like I saved this kitty. Last but not least....Carte Postale. This was fun, quick and just love how the background turned out. As you can probably tell by now I love my backgrounds and techniques. I am known on a couple boards as the "Technique Junkie" and I believe I am. Is that a bad thing? certainly not!!! I stamped this large stamp Becky gave me with Versamark embossing ink, then embossed with clear embossing powder, let cool, then I blended some W/C pencils on the C/S. After the paper dried I then placed the paper between a folded computer page, ironed the image which lifts off the embossing ink and you can see the original colour of your C/S and the blended colours all around. Well that's it for now and thank you for visiting my gallery today. Off to see what kind of trades I can do. I will keep you updated. ooh loverly.. all of them.. especially the postal one...lol thanks for the info on how you did them too..
Love the way you write the stories and also give the description. Great post, Les! I am learning so much!